Low-energy nuclear reactions, historically known as "cold fusion," will get their 12 minutes of fame on CBS TV's "60 Minutes" Sunday at 7 p.m. Eastern Standard Time in a program titled "Cold Fusion Is Hot Again." This is the second TV program on “cold fusion” to run within the last few weeks. “Brink,” a show on Discovery’s Science Channel, ran an episode called “Cold Fusion Cracked?” that aired March 27. According to “Brink” guest Dwight Williams - introduced as a senior science adviser with the U.S. Department of Energy - there might, in fact, be something real about all of this - that is, real science, real hope and, quite possibly, a real source of energy. Jean Paul Biberian, a French researcher who has been working on LENR for 20 years, was quoted many years ago saying, "It's history in the making, what we are living through here." The battle for credibility and redemption for the field has been long and hard-fought. German physicist Max Planck predicted the nature of such scientific revolutions. "A new scientific truth does not triumph by convincing its opponents and making them see the light," Planck wrote, "but rather because its opponents eventually die, and a new generation grows up that is familiar with it." Almost poetically, John Maddox, the editor of Nature magazine and prominent opinion leader in the academic battle to dismiss "cold fusion" outright, died Sunday. He was widely quoted for his comment, "Broadly speaking, it’s dead, and it'll remain dead for a long, long time," referring to "cold fusion." Three weeks ago, researchers from Space and Naval Warfare Systems Center (SPAWAR) Pacific made headlines with unambiguous evidence of nuclear particle emissions from their LENR experiments. The group has been working, mostly quietly, on LENR for 20 years. Representatives from a "cold fusion" laboratory, Energetics Technologies LLC of Califon, N.J., tipped CBS off a year ago that "cold fusion" research was still alive. Rick Kramer told New Energy Times that he handles "media management" for Energetics. CBS has kept a tight lid on the exact nature and angle of the story it will run, though it is expected to investigate the most controversial aspect of "cold fusion," excess heat. The "cold fusion" discovery is attributed to electrochemists Martin Fleischmann and Stanley Pons, when they were at the University of Utah. They and university administrators Chase Peterson and Jim Brophy announced the discovery in a press conference March 23, 1989. Fleischmann and Pons had noticed more heat being produced from their electrochemical cell than could be explained by any known chemical process. The amount of energy, in the form of heat, was in the range of nuclear energy, but none of the typical harmful side effects of conventional nuclear energy was apparent. CBS approached three U.S. government agencies that are doing LENR research: the Defense Advanced Research Projects Agency; the Naval Research Laboratory; and the Space and Naval Warfare Systems Center in San Diego. New Energy Times has learned that representatives from all three agencies spoke with CBS but turned down CBS' request to go on camera. Frank Gordon, with SPAWAR, told New Energy Times that his group prefers to maintain a lower profile and stick to the peer-reviewed journals and science conferences. New Energy Times learned that SRI International permitted electrochemist Michael McKubre, director of the Energy Research Center at SRI International, in Menlo Park, Calif., to appear on camera. McKubre and Energetics Technologies' founder Irving Dardik, inventor of a proprietary triggering waveform, are part of a consortium that completed a series of replications several years ago that enhances the LENR excess-heat effect. Energetics has produced an excellent animation to depict much of what LENR researchers understand about the loading of deuterium into a palladium lattice. However, the animation's mention of fusion as the explanatory process and energy release of exactly 24 MeV is highly speculative. Alternatively, researchers Allan Widom and Lewis Larsen speculate that a weak interaction process rather than a fusion process is responsible for the generation of excess heat, heavy element transmutation and the production of helium and neutrons seen in LENR research. The consortium’s experiments, funded in part by DARPA, produced 10 percent to 300 percent more energy than they consumed in 12 of 23 experiments. Their work was published last year in the peer-reviewed American Chemical Society "Low-Energy Nuclear Reactions Sourcebook," by Oxford University Press. CBS asked Robert Duncan, vice chancellor for research at the University of Missouri and an expert in low-temperature physics, to look into the LENR research. Duncan was referred to CBS by Allen Goldman, the head of the condensed matter physics group at the American Physical Society. Duncan comes with strong credentials: a fellow and life member of the American Physical Society, the chair of the Instrumentation and Measurement Topical Group for the American Physical Society in 2002, the Gordon and Betty Moore Distinguished Scholar at Caltech in 2004 and 2005 and more. Caltech has earned a place in "cold fusion" history as the breeding ground of contempt for the discovery. Its theoretical physicist Steven E. Koonin was quick to denounce Fleischmann and Pons as incompetent and delusional. Koonin is the chief scientist for BP and recently was appointed the U.S. Department of Energy undersecretary for the Office of Science. Duncan spent several weeks (on his own time) investigating LENR in October. CBS paid his travel expenses to meet with researchers at Energetics' laboratory in Omer, Israel, and observe a working LENR excess-heat experiment. Duncan emphasized to New Energy Times his objectivity of and independence from the research. "‘60 Minutes’ asked the American Physical Society for a reference for someone like myself who’s done very careful measurements in related fields but not specifically in LENR," Duncan said. "I've never been involved in any 'cold fusion' research in the past, nor am I involved in any now." Duncan also met with researchers at NRL in Washington, D.C., and the SPAWAR researchers when they were in Salt Lake City at the American Chemical Society meeting in March. He was skeptical of the LENR excess heat before his investigation. New Energy Times spoke with Duncan today. "I had not studied ‘cold fusion’ before, so I had no idea that these excess-heat results were real," Duncan said. "I had heard the controversy back in 1989, and from that, I was suspect of the entire field. "Sam Hornblower of CBS asked me to read some papers and talk to some of the scientists, and it quickly became clear to me that it was a very interesting result. After I saw some of the hardware, I had a chance to ask about the experimental configurations and dig in deeper, and now I am convinced that this excess-heat effect is real." Duncan was particularly impressed with the SPAWAR research because of its clear evidence for nuclear reactions. "I had a chance to see their results in detail in Salt Lake City during the American Chemical Society meeting, and I was very impressed," he said. "The CR-39 particle tracks look as though they show much of what is expected from nuclear reactions inside these materials, so I think this is a very exciting development." Richard Garwin, a prominent U.S. physicist, was interviewed for the "60 Minutes" piece and was asked about his views on the LENR excess heat, though Garwin did not visit the Omer laboratory. 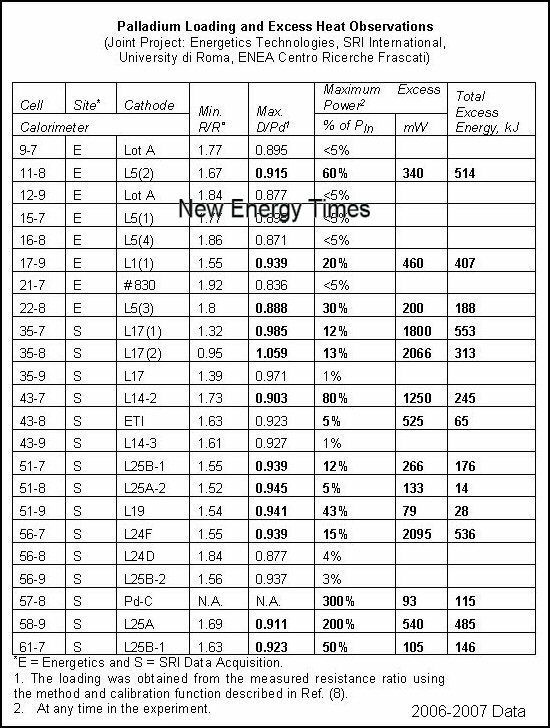 He had visited the SRI laboratory many years ago and secretly reported to the Pentagon that SRI had correctly measured significant levels of LENR excess heat. "The uncertainty in excess power measurement is about 50 milliwatts," Garwin wrote, "but the excess power appears to be on the order of 500 milliwatts or even 1 watt peak...we note that a chemical reaction involving the palladium at perhaps 1.5 eV per atom would correspond to about 3.5 kJ of heat; this is to be compared with the 3 Mj [One thousand times greater] of 'excess heat' observed, so such an excess could not possibly be of chemical origin." Publicly, however, Garwin has yet to recognize the validity of LENR excess heat. Sources told New Energy Times that CBS went to Frascati, Italy, to get footage from the ENEA Frascati laboratory, the Italian Agency for New Energy. Of the 300 researchers at ENEA Frascati, two-thirds perform "hot" fusion research. Although De Ninno is no longer funded to perform LENR research in the highly competitive field, another researcher, Vittorio Violante, who is part of the consortium with SRI International and Energetics Technologies, has been able to continue LENR research at ENEA Frascati on limited funding. An Italian news story states that Violante has received funding form the U.S. Department of Energy, though New Energy Times does not have independent confirmation of this. Sources also told New Energy Times that CBS went to the United Kingdom to get footage of cold fusion co-discoverer Martin Fleischmann, as well. The other discoverer, B. Stanley Pons, has remained out of the spotlight. Many mysteries about LENR research remain. One mystery about the "60 Minutes" program - which may or may not be solved Sunday - is the effect on the U.S. Department of Energy and the U.S. Patent and Trademark Office. How have they responded to this new area of research and potential technology? Another mystery is the future of the hot-fusion programs. In France, the world's largest magnetic doughnut will be built soon. Only the International Space Station has exceeded the cost of the hot-fusion doughnut as the world's most expensive science project, at least $20 billion spent so far with another $20 billion committed. In California, the National Ignition Facility recently announced progress with its inertial confinement fusion developments. Its experiment will use the world's most powerful array of lasers. NIF's primary mission is for nuclear weapons, but it's been sold to the American public as a possible future energy source. 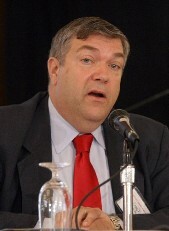 In 2006, New Energy Times asked Craig Smith, a senior scientist with Lawrence Livermore National Laboratory, about the progress of NIF as an energy source. Smith evaded the question. "My understanding is that, by the year 2010 or so," he said, "there will be some experimental applications that will give us important answers concerning the viability of inertial confinement fusion as an energy source." At the International Conference on Emerging Nuclear Energy Sciences in 2007 in Istanbul, Turkey, Edward Moses, associate director of Lawrence Livermore National Laboratory, answered questions from scientists about the feasibility of NIF as an energy source. One member of the audience asked Moses how much energy NIF would create, but Moses initially evaded the question. He first explained how much energy the device would consume. When the questioner asked him directly to state how much net energy would be generated, Moses said that was not the point. "NIF should be looked at as an exploration to learn more about fusion, not as an energy-producing experiment," he said. Moses said that overall efficiency "from the wall plug" to release of energy from the laser reaction was expected to be only 20 percent of the input power, in the foreseeable future. On March 10, NIF broke a world record for a laser fusion facility as its array consumed 1.1 million joules of electricity, most likely generated by a coal-fired or a nuclear fission plant somewhere in the distance. "This is an incredible milestone on our journey to ignition," Moses said. "It was a great night that was the culmination of 15 years of incredible work by the entire NIF team. We are well on our way to achieving what we set out to do: controlled, sustained nuclear fusion and energy gain." Jim Bono, director of public affairs for the Lawrence Livermore National Laboratory, confirmed to New Energy Times today that NIF gets its energy from the commercial power grid. Thermonuclear fusion: 58 years, $40 billion, 80 percent energy loss. Low-energy nuclear reactions: 20 years, a few million dollars, 10 percent to 300 percent energy gain, production of a few watts.